In a career strewn with awards, Robbie Williams has quite simply sold more records than any other British solo artist in history. Having sold more than 70 million albums over his solo career, Robbie has also won more Brit awards than anyone else - a grand total of 17. Six of his albums appear in the all time top 100 biggest selling albums in the UK whilst Williams holds the record for the most concert tickets sold in one day – 1.6 million in 2006. In 2010 Robbie won the Outstanding Contribution to British Music award at the BRITs. In 2010 Robbie re-joined Take That for a record breaking tour and album, which became the fastest selling album of the century. In 2012 his single “Candy” topped the chart, becoming his 14th No 1 single and the fastest selling single of the year by a male solo artist. Robbie released “Swings Both Ways” in November 2013. The album saw him reunited with long-term writing partner Guy Chambers and features collaborations with Lily Allen, Rufus Wainwright, Michael Buble, Olly Murs and Kelly Clarkson and was the 1000th UK number 1 album. 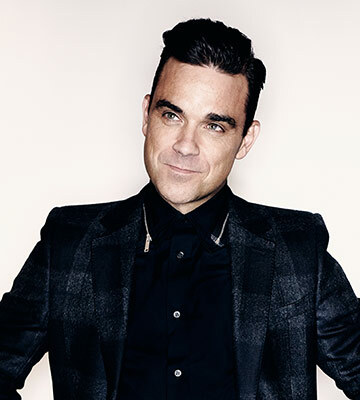 In 2015 Robbie embarked on his “Let Me Entertain You Tour” performing over 40 dates across 3 continents, including several cities he had never played in before.